Over the last couple of days my son and I have deployed our 1941 Soviets and Germans for a series of challenging Spearhead games. In both games the Germans have been restricted to relatively small but well motivated formations. In contrast the Soviets have fielded numerically larger formations which have been significantly hamstrung by defensive requirements and completely inflexible command and control. The games were both generated with the Scenario Generation System and to the German commanders relief both battles found the Germans on the offensive. I remain nervous of facing a massive Soviet counter-attack! Brief reports of both games can be found on my Spearhead blog. The first looks at the Soviet Pocket around Dzhelishay while the second action focuses on the Defence of Zahvizdya. Both involve reinforced brigade actions with all models in 6mm. As regular readers will know I enjoy gaming several different periods but one ruleset I particularly enjoy is Spearhead. In particular the World War II version. Spearhead has for me an excellent balance between command level challenges and technology. Further, the rules are not too complex, meaning a player doesn’t feel exhausted at the end of the game. 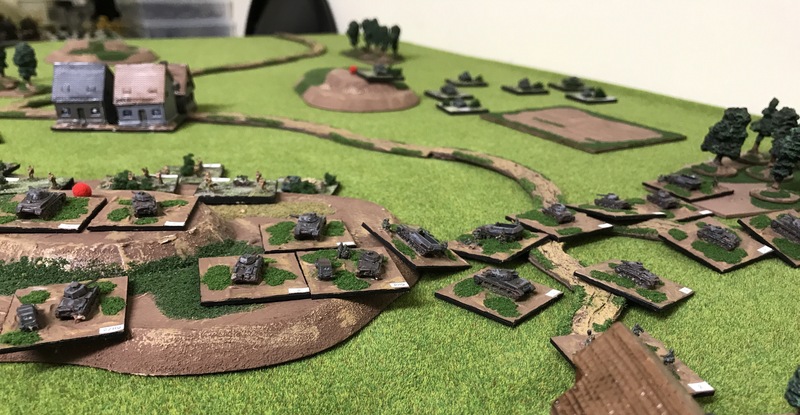 For some years my Spearhead games have been focussed on the and 1944, in part because I was in the process of rebasing the early war collection and painting extras. Over the last year I finally completed the first phase of this rebasing project allowing me to finally breakout my miniatures for a series of cracking good early war games. The fascinating thing about this period, for me at least, are the challenges the various armies had with doctrine and technology. Lessons from the Great War had been learnt but their application on a different battlefield was not straightforward and continued to be refined sometimes due doctrine and on others due to limitations around rearmament. Obvious examples are the British light, infantry and cruiser tanks, as well the various early Panzer I and II tanks of the Germans. Of course all nations had similar challenges. On the battlefield what do you actually do with a Panzer I or a Vickers Mk VI? The technological challanges were very evident in our most recent game. However, with Spearhead you actually need to focus on the coordination of various arms realising you will pay the price when you can’t achieve these sufficiently. Of course all these interesting technologies, combined with trying to achieve combined arms, are made even more interesting by the tactical situation and two players duelling to place their opponent at a disadvantage. What a great way to spend an evening! 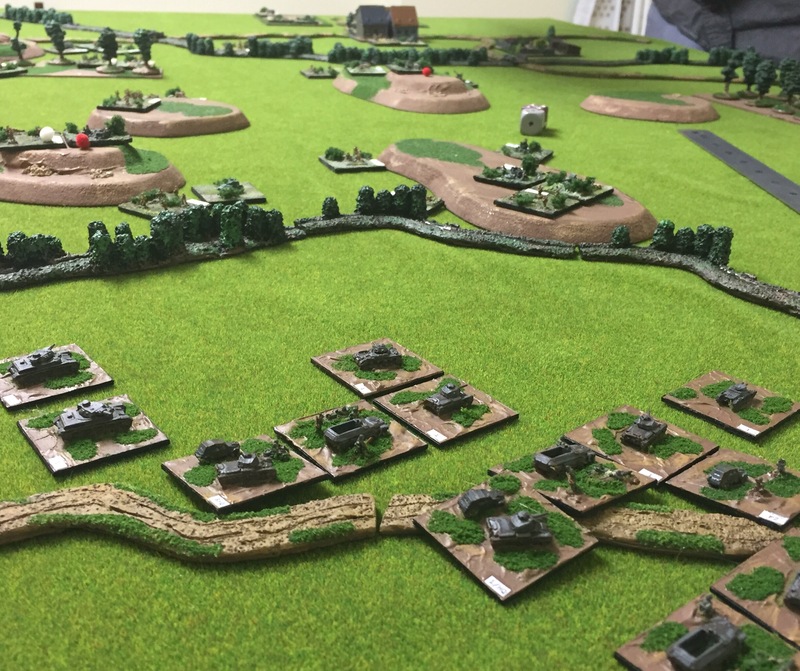 Making the most of the Easter break it was good to dust off my late war British for a Spearhead game. Due to my opponents armies I tend to find myself using Germans so deploying the British was rather appealing. My British Infantry Brigade in 1944 can be supported by Shermans and Sherman Fireflies or the slow moving and poorly armed, but well armoured, Churchills. After some consideration I opted for the Churchills. Played over a few hours spread over a couple of days it was all that I hoped it would be. Well balanced with a number of tactical problems all combined with a little good luck interspersed with equal measures of bad luck. If you’re interested a few photos of our game can be found here. It seems we are in “Spearhead mode” at the moment. Taking advantage of a long weekend Jim and I deployed two 1944 formations for a World War II Spearhead game. 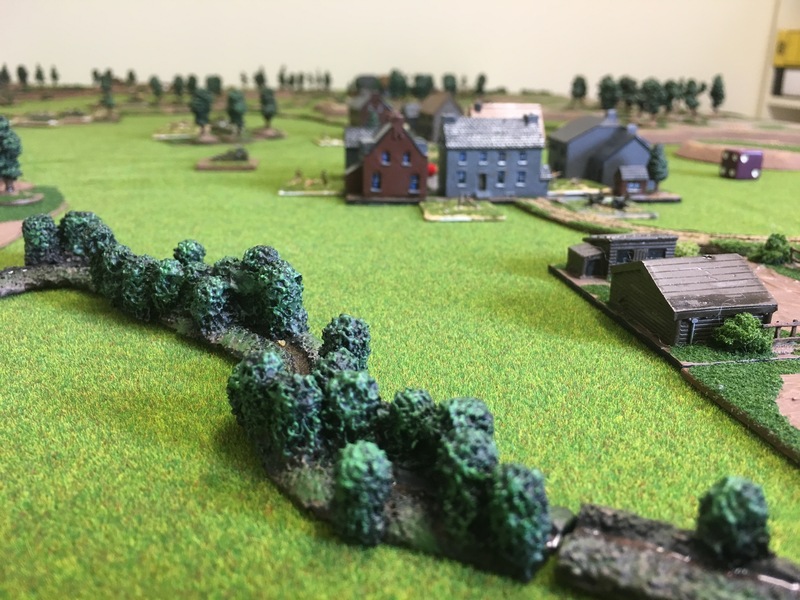 The scenario found a elements of 17th SS Panzer Grenadier Division undertaking a hasty attack on a defending regiment drawn from the 5th American Infantry Division. The game highlighted many of the aspects of a well balanced scenario. The Americans were reasonably well supported but stretched in defence. A number of gaps in the American dispositions existed and with good planning could be exploited. There was room for concentration of effort with multiple battalions and supporting weapons working together. However, the friction of battle could result in delays which needed to be avoided if the momentum of attack is to be maintained. Indeed, in our battle the German plan got underway on time and excellent initial progress was made. First objectives were seized and follow on attacks began. However, some of the subsequent attacks took longer than planned resulting in other battalions becoming overcommitted. Now blocking troops and local counter-attacks caused problems for the German commander as the battle swung against the Germans. A report of our engagement “Götz von Berlichingen – Advance!” can be found here. Spearhead gaming has continued here with two excellent games being played. Earlier in the week Jim and I caught up for another 1944 game between his Americans and my Germans. You can find a report of the game here. Yesterday evening Robin and I deployed our forces for a 1940 game set in France. 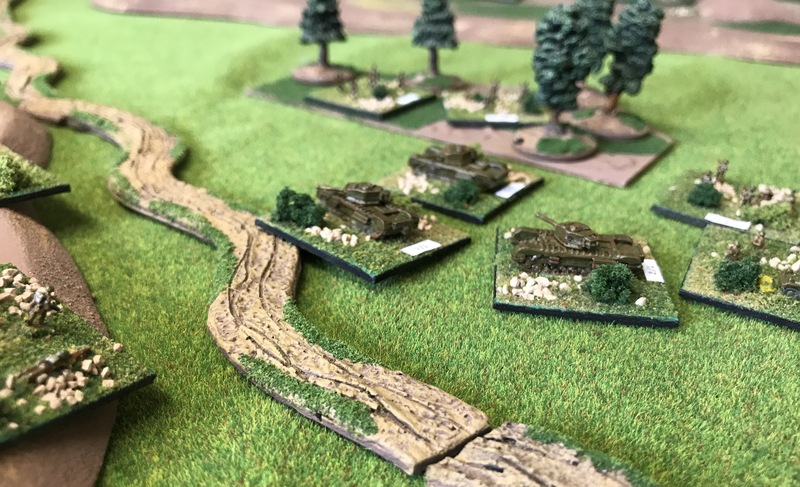 As is normal here the games involve reinforced brigade level actions that provide plenty of challenges but allow the game to be fought in an evening. However, it has been a long time since my early war Panzers have been out of the box. In the past I’ve played a number of games set in Russia during 1941 but few in France. Given I had some time during the holidays, in between reading and gardening, I set out to rebase my Early War Panzers. The models are veterans, painted many years ago. Yet once the basing was complete, and some quick highlighting to enhance the models, they were ready for the table. One of the most obvious difference in 1940 is the basic nature of the tanks. German tanks generally have a main armament of a 20mm cannon or 37mm gun while Panzer I, only a machine gun. All of which are of limited value when confronted with infantry. The armour on these vehicles is also thin, making them vulnerable to anything larger than a machine gun. 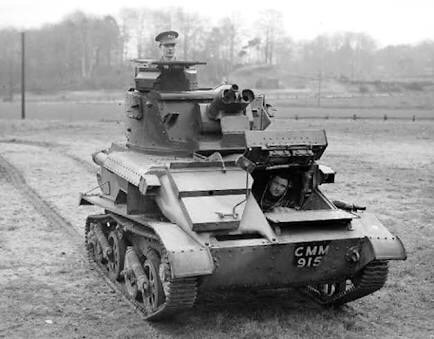 Fortunately the British are much the same, with the exception of the Matilda tanks. Of course Spearhead doesn’t focus on armour thickness or weapon penetration. Instead, your placed in the role of a brigade or divisional commander where you really need to consider higher level tactics and command and control. 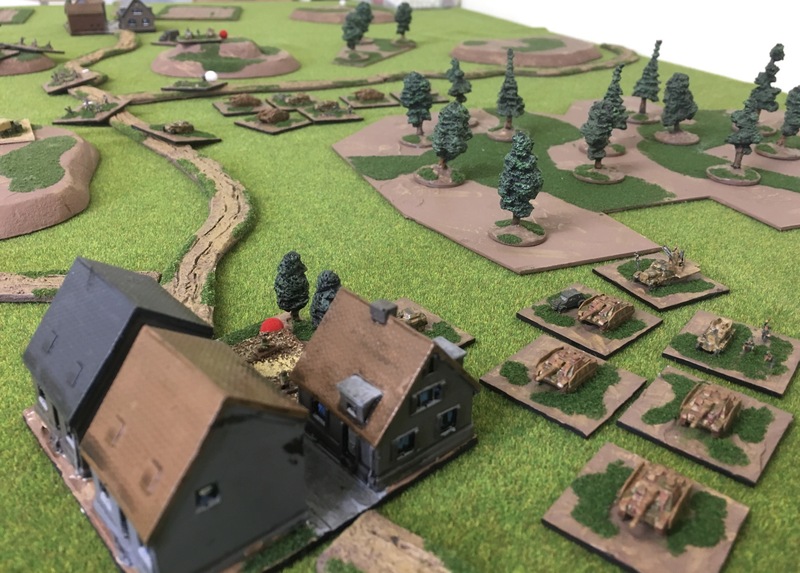 If you are interested I encourage you visit my Spearhead blog where a report outlines our game, Pawns Against Panzers.